Based on the stories of three of the sailors in the 1968 Golden Globe Single Handed World Circumnavigation, ‘Great Circle’ explores the extraordinary strength, passions and resolution of those who heard the siren call to pit themselves against power of the world’s most feared oceans – and of those who stayed behind, watching and waiting. The cantata reflects the triumph and the tragedy of sailors and families, storms and doldrums and the aching void of separation from human contact. That only one sailor finished the ordeal – Sir Robin Knox Johnston, who sailed into the history books – makes this a compelling narrative in its own right. 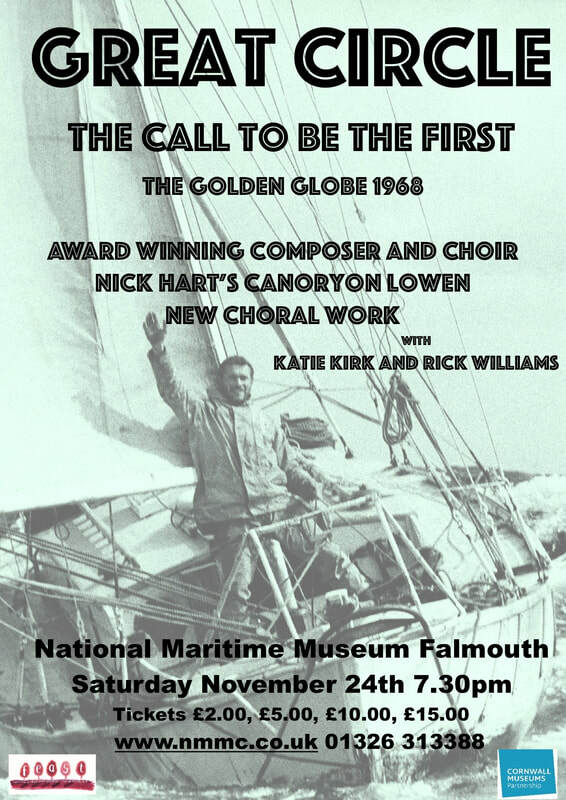 The work, commissioned by The National Maritime Museum (Falmouth) will be performed by the award winning choir Canoryon Lowen, directed by the composer Nick Hart, himself an experienced liveaboard sailor, for whom creating this work has been a bitter-sweet labour of love, and by co-director Janet Wright. The choir will be joined by the celebrated Cornish duo Katie Kirk and Rick Williams with their own interpretation of the songs of separation written by Nick. The performance will be in promenade form, with the audience and choir able to move around the extraordinary space that is the Falmouth Maritime Museum, using projected images and narration by local actor Kevin Kibbey. Belatedly – thank you so much for last night. Nick’s production was amazing – Polly and I were both talking about it all the way back …. what a terrific production! ….. I hope you’re truly proud of an impressive work of art. And a great collaboration – you have got me thinking……Gordon Seabright CEO Eden …. Literally just walked in the door, but really want to say how much I (we, the audience) enjoyed this evening’s musical entrancement. To say that it was extraordinary would be a serious understatement! Swept up, swept away, lifted up, dropped deep within a maelstrom of music that crashed in upon us, wrenching our very souls, then spitting us out wrecked, wretched and overwhelmed, yet safely cradled in the bosom of the ocean of sound! No doubt, as it’s creator, there were details which you alone would notice, but as the premiere audience (that’s premiere, not premier!) we were stunned by the sheer elegance, breadth and depth of your work, likewise by the way in which it was performed. The atmospheric venue was of course most advantageous, but your music filled the whole of that vast space with apparent ease. At the end the silence was deafening, as the audience held its collective breath, not really wishing to applaud too soon, so as to appreciate and savour the beauty of the ending. Parts reminded me of Britten, or Taverner (but you know how good (!) my understanding of music really is), but everything carried your own inimitable stamp of minimum notes to produce maximum effect. (That really is meant in a most positive sense!). There were several moments of rapid emotional swings, at least one of which almost brought tears to this old, rough, tough guy’s eyes, and we all came away feeling that we had been not just entertained but also most definitely enlightened and educated (Moliere’s “plaire et instruire”). Truly a most amazing evening! Thank you (all) for allowing us to share this stunning experience! Best Wishes David Turner. Nick and I really enjoyed the Great Circle last Saturday. An amazing work, you must be very proud of it. Fantastically performed by all concerned. We do hope that you are planning to put it on again sometime soon. There are so many people that we have spoken to who, having heard all the positive comments from those who heard it, would love to have the chance to do so themselves. I know we are probably rather biased, and proud of our family, but we enjoyed every moment, from the sirens to that beautifully haunting finish. With best wishes, Nick and Alison Maiklem.